Conventional orchestra concerts generally contain three pieces of music: an overture, a concerto, and a symphony. The East Metro Symphony Orchestra almost never performs conventional concerts, so when it’s time to explain exactly what is going to happen at our performances, especially in a more unusual program – such as our upcoming Celebration of Finnish Music – it’s hard to explain fully the richness of what is to come. We started with a simple idea, to perform a program of music from Finland, as part of the international celebration of Finland’s 100th anniversary of independence. (See It All Started with a Guy Named Bud for details.) For me it would never be compelling enough to simply play an orchestra program of music by Finnish composers, or as would probably happen, to play an entire concert of music by the marquee Finnish composer Jean Sibelius – After all, why come to such a concert by a modest community orchestra when the august Minnesota Orchestra led by a master Finnish conductor Osmo Vänskä is right down the road? So, in order to create a program that could show Finnish orchestra music in a new light, give people a reason to come hear a modest community orchestra, more deeply honor the cultural history of Finland, and in so doing educate ourselves and our audience, I chose to focus our program on the very rich tradition of folk legends – actually originally sung legends – of Finland, starting with the best-known of them all, the epic poem Kalevala. By working with Minneapolis-based, master poet, singer and kantele player Diane Jarvi – the kantele being the folk instrument that historically accompanied the singing of the Kalevala’s poems – I was introduced to the musical elements, cultural background, and traditions of the Kalevala. Continually having to ask Diane to explain the simplest things, I was often reminded how different artistic traditions have their own unique terminology and understandings, and how much we gain by crossing those conventional boundaries whenever possible (even though we might feel like a rank beginner in the process). 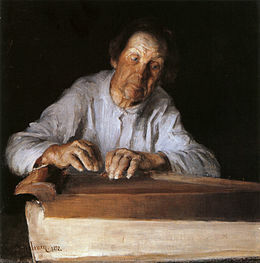 I would simply search for orchestral music by Finnish composers, music that was grounded in the Kalevala (or other Finnish folk tales), that might be playable by our amateur musicians, that sounded interesting, and that would actually be available for us to procure – either from our own music library, from libraries of other orchestra we regularly borrow music from, or for purchase or rent (either from publishers in the U.S. or in Finland). In turn Diane would listen to recordings of the music I chose, to determine their exact connection to Finnish folk tales and tunes. Our goal became to create a type of dialogue for our performance, where EMSO would perform a piece of Finnish orchestral music and Diane would provide some context, showing, telling, performing elements of each orchestra piece’s folk elements. In so doing she would also display her own art forms. The “simple” process of looking for appropriate orchestra music wasn’t so simple after all, since I personally had no experience with Finnish folk tales or tunes. I blindly dove into my own collection of recordings (fortunately augmented by a good dose of Finnish orchestral music because we live in the land of Osmo Vänskä and his Minnesota Orchestra), eagerly reading liner notes to glean which music had authentic roots in Finnish folk tales. I also searched YouTube for recordings of Finnish orchestral music, did many Google searches for connections between Finnish folk legends and orchestra music, and even corresponded with Music Finland, which has a remarkable library of Finnish compositions and resources about Finnish music and composers. In the end it was that special combination of factors – availability of printed music (at a modest price), ability to be performed by amateur musicians, authentic roots in Finnish folk takes, a clear sense of how each work might fit into our concert program, and simply if it sounded interesting – that helped me choose orchestra music for this program. 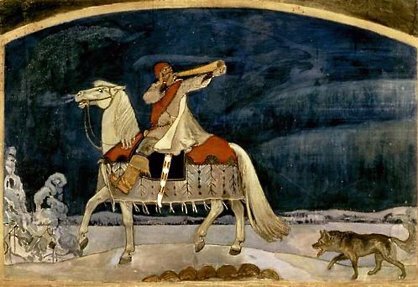 I ultimately chose a very-rarely heard work by Jean Sibelius, En Saga (which to me depicts a truly remarkable journey, perhaps of a lifetime), Sibelius’ bewitching “Ballade” from his Karelia Suite, Uuno Klami’s direct musical depiction of a story from the Kalevala: “The Forging of the Sampo,” and, of course, Sibelius’ epic ode to Finland, his Finlandia. Each piece of orchestra music will be introduced by Diane’s depiction and description of its actual roots in Finnish folk legends and tunes, some demonstrated through poetry readings, some through folk songs, some through the simple playing of her many kanteles. Part of the orchestra’s preparation for this concert was a workshop with Diane, where she introduced some of the cultural background, as well as sounds and poetry that were deeply embedded in the orchestra music we’ve prepared. As part of the workshop Diane taught the orchestra members a traditional Finnish folk song, Taivas on Sininen “by ear,” rather than reading from printed music. We’ve decided to give our audience the chance to sing this famous tune as well, accompanied by Diane and the orchestra. The last step in our preparations is for Diane and me to work with EMSO’s video guru, Anna Salisbury, in order to create a slideshow of important visual images that will enhance each step of our concert program, and to collect Finnish cultural artifacts from our community to have on display at the concert. As in most programs that cross conventional boundaries, Diane and I have been able to learn much from each other, EMSO musicians have grown to understand through their work with Diane the origins of their orchestral music’s sounds, forms, and stories, and we expect our audiences of orchestra music will learn about the folk music that inspired it, while audiences of Finnish folk traditions will learn about the orchestra music that grew out of these traditions. In the end we continue to hope our project adds something of value to the important international celebration of Finland’s 100th birthday, and that we will present our own unique and worthy contribution to the vibrant Nordic culture of our community. Sunday, May 21, 2017 at 2:00 p.m.